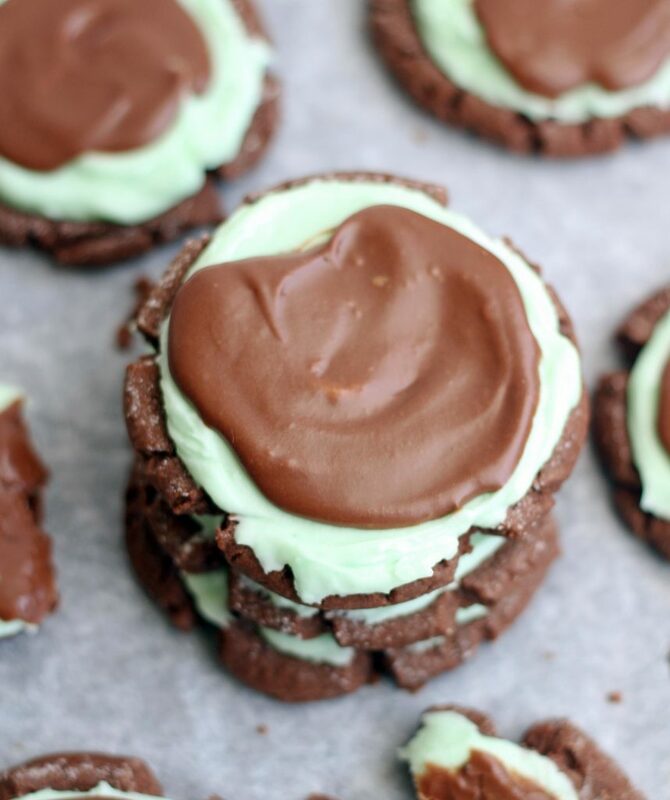 These Chocolate Mint Sugar Cookies are amazing! 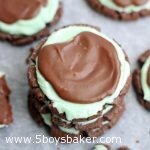 A soft, chocolatey cookie topped with mint buttercream and finished off with a chocolate glaze. 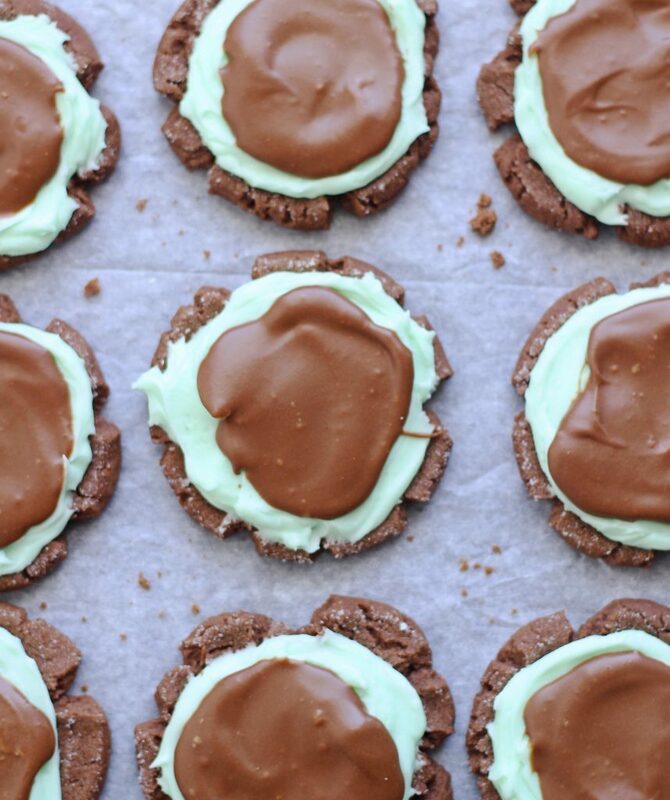 The perfect cookie for St. Patricks Day or really any time of the year! I’ve never been one to go all whoo hoo crazy for St. Patrick’s Day☘️. Other than sugar cookies with green frosting, I may have occasionally over the years made green pancakes for breakfast, but that’s about all. The whole pinching thing if you’re not wearing green is lame! I remember as a kid being pinched really hard one time and I’ve thought it was stupid ever since. This year I took my sugar cookies up a notch and made these Chocolate Mint Sugar Cookies. They are seriously amazing. Braydon declared them waaaay above the blog worthy standard my boys have set. I kind of have to agree. Now while they are absolutely delicious eaten at room temp, my favorite way to eat them is cold so I keep them in the fridge. You eat them however you like, either way I’m pretty sure you’ll love them. In a large mixing bowl, cream together butter, oil, sugar, powdered sugar, and water. Add in egg and mix well. In a medium-sized bowl, combine flour, cocoa powder, baking soda, cream of tartar, and salt. Mix well and slowly add to the butter/sugar mixture until combined . Roll dough into golf-ball sized balls and place on non-stick cookie sheet or cookie sheet lined with a silicone baking mat. Dip the bottom of a glass into excess sugar and press on to each dough ball (re-dip cup in sugar each time) to flatten the cookie slightly, just until edges start to crack (don't press it too thin). Bake 8-9 minutes (they will still look underbaked). Do not over-bake. Let sit on cookie sheet for a couple minutes then transfer to a cooling rack. Frost with mint buttercream and chocolate glaze when cool. Mint buttercream: In a medium bowl, combine butter, half-n-half, peppermint extract and powdered sugar, mix until smooth. Add green food coloring and mix well. Spread evenly over cooled sugar cookie. Glaze:In a small bowl combine butter, cocoa, powdered sugar, vanilla and water. Mix until smooth. 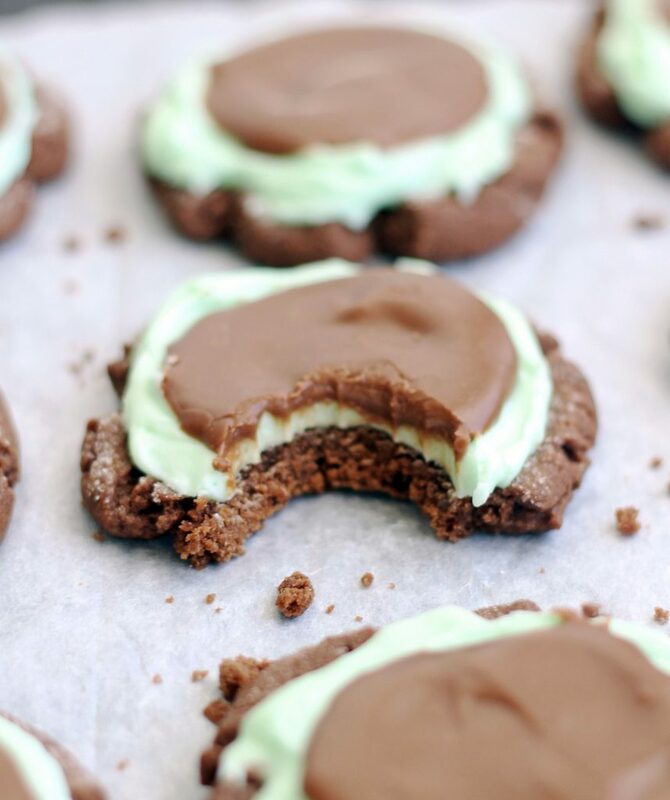 Spread a spoonful of glaze over mint buttercream. Serve cold or at room temp.